HERRIMAN — After outrage led Salt Lake County Mayor Ben McAdams to veto the high-density Olympia Hills development, Herriman city leaders are now gearing up to work with the developer to perhaps have some say over the project. Earlier this month, the Herriman City Council approved a $30,000 budget amendment to fund a study of the 930-acre property and what kind of density would be appropriate for the area's infrastructure. The results of the study could produce a proposal to the Olympia Hill's developer, Doug Young, to find middle-ground on the project and potentially lead to the annexation of the property into Herriman city limits, Gordon Haight, Herriman's assistant city manager, said Friday. "I've talked to Doug, and I think we just need to figure out what the city's comfortable with and get back to him to see if we can approve a plan that would work for everybody," Haight said. Young did not return a request for comment Friday. It's up to the developer to submit an application for annexation, so Haight said any proposals or agreements made regarding the property (located between 6300 West and 8500 West and 12400 South and 13100 South) hinge on the results of the study, expected in roughly three months. "What we're trying to determine is we want to make sure we're responsible for the infrastructure — that we don't propose anything that's going to hurt the residents or diminish the quality of life we have," Haight said. The site for the Olympia Hills proposal is in unincorporated county bounds — meaning Herriman officials don't have any say over planning the area; it's within the county's jurisdiction. Before McAdams vetoed it, the Salt Lake County Council had approved the development with a density for an estimated 30,000 residents — a proposal Herriman officials and leaders from other south valley cities fought. A group of concerned residents also filed an application for a referendum to put the development on a future ballot, had McAdams not vetoed it.Herriman leaders have long considered the land as a potential area for annexation, Michael Maloy, Herriman's city planner, told council members during a July 11 work session meeting. Regardless of whether the property is in our outside of Herriman's boundaries, Councilwoman Nicole Martin said a study of the area would be "very helpful information to relay to the county, to relay to the public, to relay to our residents." "My initial thought was I didn't want the city to spend $30,000 putting together a plan that was hinged on Olympia Hills being in our city, because I'm not entirely certain that the developer has given us any sort of commitment that that's the case," Martin said, but she supported the study to collect information for what would or wouldn't be appropriate for the area. Haight told council members the study would be an "opportunity" for Herriman, noting that he's been in communication with Young and his team. "They're more than happy to do an application for the city, but they want to know what it is we're going to do and how we're going to keep it from being a referendum," Haight said, adding that after the study is complete, city officials can "go to Doug and say, 'This is what we have to offer.'" Councilman Jared Henderson noted city officials "can't do anything" to stop a referendum application. "That's (up to) the residents," he said. Haight acknowledged that, adding that if city officials aren't "comfortable" with the proposal coming back before the County Council, "I think we need to be very proactive and decide what we want to do with this property, make the decision, and I think we can annex it into our city." Haight said Friday he and other city officials also plan to involve leaders from other cities, including South Jordan and Riverton. As of Friday, after McAdams' sent the project back to the drawing board when he vetoed the project, no other application for the area had been submitted to Salt Lake County officials for consideration, McAdams' spokeswoman Michelle Schmitt said. Schmitt noted that McAdams "feels strongly that transportation congestion issues must be addressed before new development plans move forward." Bluff residents will head to the polls on Tuesday, June 26 to elect their first city council since voting to incorporate last year. In San Juan County and across the State of Utah, voters will vote in a primary election that will help pare the list of candidates for the November general election. The 2018 elections will feature races for all three Commission seats and all five school board seats after a federal judge recently redrew election district boundaries. The San Juan County Clerk’s office has received nearly 800 election registrations, with the vast majority being duplicate registrations. They report that the new registrations are helpful to ensure that mailing addresses are correct. The clerk’s office encourages any citizen who hasn’t received a ballot to contact the office immediately. Six candidates are running for four council seats, and will serve either 1.5-year or 3.5-year terms. Yard signs have sprouted up across town in support of the two mayoral hopefuls, Marcia Hadenfeldt and write-in candidate Ann Leppanen. The election is the result of more than two years of work by a group of citizens who formed an incorporation committee in 2016. After collecting signatures from 20 percent of registered voters and from property owners representing 20 percent of the assessed property value in the proposed town boundaries, the committee submitted a petition to the Utah Lieutenant Governor’s Office in 2017 to begin the incorporation process. On November 7, 2017, 80 percent of registered voters in Bluff turned out to approve incorporation by a 49-point margin, with 122 ballots cast. 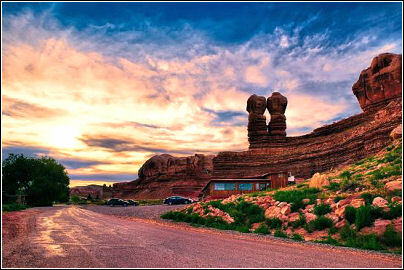 Although Bluff is the county’s oldest settlement, the site of a large Ancestral Puebloan village nearly 1,000 years ago, and founded as Bluff City by the Hole-in-the-Rock pioneers in 1880, it has remained an unincorporated service area except for a brief period in the 1970s. In 1976, the San Juan County Commission approved the town’s incorporation after receiving petition signatures from 130 residents. A mayor and city council were elected, but in 1978 residents filed a disincorporation petition, alleging legal problems with the original incorporation process. Later that year, a district judge ordered the issue be put to vote and residents voted 67 to 44 to disincorporate. More volunteer committees were organized in January to begin researching issues the council will face after candidates are elected, such as writing planning and zoning codes, managing roads, and providing services. The volunteers have met regularly for the last six months and will present their reports when the mayor and council take office in July. Bluff’s approved city limits encompass 38.5 square miles and stretch from Recapture Wash to Comb Ridge and from the San Juan River to the Bluff Bench. Bluff is set to become the county’s largest municipality by footprint, and with only 265 residents, its smallest by population. The city council will have six months to prepare before officially taking over management of the area at the beginning of 2019. The incorporation effort has seen its share of criticism. In an October 2017 article in the San Juan Record, San Juan County Administrator Kelly Pehrson questioned whether the town would be able to afford the cost of providing services like road maintenance and law enforcement to such a large area. And Editor, Bill Boyle, spoke with anonymous Bluff residents who shared Pehrson’s skepticism. Bonneville Research later disputed Pehrson’s conclusions, however, and stood behind its feasibility study. Springmeyer noted that Transient Room Tax (TRT) was not included in the report and that some tax information was confidential. The Bluff Service Area generates more TRT revenue than either Blanding or Monticello. At a series of three recent public forums for Bluff City Council contenders, candidates largely agreed with each other on issues such as seeking an International Dark-Sky Association certification and cooperating with the county to provide city services. Both mayoral hopefuls agree that Bluff Water Works, long a point of contention in town, should eventually be transitioned to city control. Leppanen said she would take steps to dissolve the water works immediately, while Hadenfeldt advocated for a more gradual transition. Half the candidates are local business owners, including Hadenfeldt (Far Out Expeditions), Jennifer Davila (La Posada Pintada Inn), Luanne Hook (Recapture Lodge), and Amer Tumeh (Desert Rose). Leppanen, Murray, Sosa, and Hook were all members of the original incorporation committee. Around 160 ballots were mailed in the Bluff election, but multiple Bluff residents did not receive their ballots earlier this month due to outdated mailing addresses. Candidates encourage any registered voters who have yet to receive a ballot to contact San Juan County Clerk John David Nielson as soon as possible. Voters can also register in-person on election day, June 26, at polling stations in Montezuma Creek, Monticello, Monument Valley, and Navajo Mountain. “The presence of a medical school here in Utah, another one, will impact the entire western United States and it will be another solution to the shortage of physicians that has already been identified,” said Richard Nielsen, the vice president of Wasatch Educational. An architect hasn’t yet been hired for the project but Wasatch Educational has already begun the search for the school’s founding dean. The school is named after the Ray and Tye Noorda Foundation, which has put $50 million toward the project. One in five medical students in the United States are training to be osteopathic physicians, according to the American Association of Colleges of Osteopathic Medicine. Physicians trained in the field address patients with a whole-body approach. The school will be under Wasatch Educational and will be affiliated with the Rocky Mountain University of Health Professions in Provo. The school will enroll 150 students a year for its first four years and then will have 175 students a year afterward. It’s anticipated the school will graduate more than 8,750 students in its first 50 years of operation. Nielsen said the Noorda College of Osteopathic Medicine will be transformational and innovating, using the latest technology and teaching students preventative care. “We anticipate this will be a world-class medical school,” he said. A few sites in Utah County have been considered for the school, with the preferred location located on 24 acres of the northwestern part of the East Bay Golf Course, pending approval from the Provo Municipal Council. The school is also looking to use the southwestern wedge of the course at least 15 years from now. The proposal includes relocating the Rocky Mountain University of Health Professions next to the medical school in 2024. The building’s plan includes having green space in and around the campus. Nielsen, who visited medical schools in seven states, said Wasatch Educational is leaning towards a traditional-style building. “We want it to blend in with the existing architecture of Provo,” he said. If the Provo proposal is approved, a groundbreaking will take place in the March of 2019 and the project will be completed in January of 2021, at which point the school will begin receiving student applications. The Noorda College of Osteopathic Medicine will generate more than $62 million in construction business, provide more than 200 construction jobs and will bring more than 121 medical school jobs to Utah County, according to an independent economic impact study from Bonneville Research cited in a press release about the announcement. The process of bringing a medical school to Utah County started seven years ago with a feasibility study and started to become a reality about three years ago. The school will receive provisional accreditation through the American Osteopathic Association Commission on Osteopathic College Accreditation. The creation of the school is in response to a shortage of medical professionals both in Utah and across the nation. The state needs 375 new physicians each year to meet the state’s need, according to the Utah Medical Association Council. Nielsen said the idea is that it’s easier to educate students locally as opposed to recruiting them after they graduate from medical schools elsewhere. The majority of osteopathic school graduates end up practicing in primary care. A partnership between the school and a hospital could come after a dean is appointed. 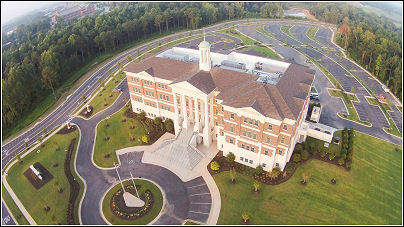 (Courtesy of Wasatch Educational) The company behind a proposal to build a medical school in Provo, Wasatch Educational, says the look and feel of the facility would be similar to this Auburn, Ala. campus of The Edward Via College of Osteopathic Medicine. Utah’s third medical school will be named the Noorda College of Osteopathic Medicine and the for-profit Provo campus plans to admit its first class of 150 students in August 2021, officials said Monday. The company behind the project, Wasatch Educational, said it had secured $50 million from the Utah-based Ray and Tye Noorda Foundation. Ray Noorda was the CEO of Novell, a former software company based in Provo; the foundation has funded several Utah medical institutions. Including construction, total start-up costs for the college are expected to reach $150 million, Wasatch Educational Vice President Richard Nielsen said in a Monday interview. He declined to reveal the names of other investors. A formal announcement of the college was planned Tuesday morning in Provo ahead of a presentation at the Provo City Council’s work session. The council has yet to approve the company’s preferred location — a site which would displace several holes of the city-owned East Bay Golf Course. The location has drawn strong opposition from golfers, including Provo City Councilman Kay Van Buren, who organized a rally against the project last month. A public hearing is scheduled for Dec. 5. The college would be the third medical school in the state, alongside the University of Utah in Salt Lake City and the recently-opened Rocky Vista University in Ivins, also a for-profit osteopathic school. Osteopathic medicine aims to put a greater emphasis on holistic care and promoting the body’s own ability to heal. Nielsen said the new school would enroll 150 students per year for five years, then 175 students after that — a tally slightly higher than yearly enrollment at the U. and Rocky Vista. Wasatch Educational also is the holding company for the Rocky Mountain University of Health Professions, a small private medical training facility in Provo. The company conducted its first feasibility study for a full medical school in 2010, Nielsen said. Initial project planning began in 2013. Rocky Mountain University of Health Professions would eventually move its operations onto the same campus, he said, though it would be managed independently. Nielsen said demand for another medical school in the state was clear. Indeed, Utah is in dire need of more doctors — requiring 379 new hires annually to keep pace with population grown and retirements, according to a 2016 report by the Utah Medical Education Council. The state relies on physicians trained out of state for 60 percent of its annual workforce needs, the report added. Utah had 207.5 physicians per 100,000 residents in 2015 — the 43rd-worst ratio in the nation, according to 2015 American Association of Medical Colleges data. The tentative plans call for building the school over 24 acres covering holes 10, 11 and 12, on the northwest corner of the golf course. Wasatch Educational has its eyes on several other Utah County properties if the golf course site doesn’t work out, Nielsen said. Wasatch Educational says the project would provide $62 million in construction business and employ 236 workers in the construction phase, citing an economic impact study by Salt Lake City-based Bonneville Research. Once built, the medical school would employ 121. The proposal for East Bay would see the three holes reconfigured and built elsewhere, with Wasatch Educational footing the bill. Nielsen said the public hasn’t received the full picture yet about the proposal. 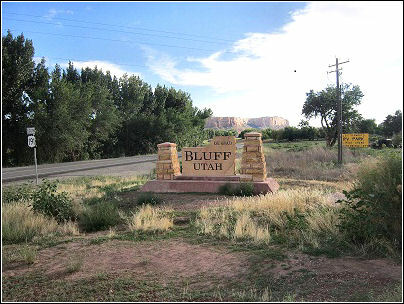 BLUFF, San Juan County — The small community of Bluff in southeast Utah soon will become the state’s newest town after residents overwhelmingly voted in favor of incorporation this week. Bluff, located in southern San Juan County near Bears Ears National Monument, has about 250 residents. In Tuesday’s election, 90 people voted in favor of incorporation and 32 voted against, according to San Juan County Clerk John David Nielson. Brant Murray, co-chair of the Bluff Incorporation Committee, said Bluff’s citizens are planning for the future. “I think the people of Bluff are excited about this opportunity for self-governance,” Murray said. Currently, Bluff is known as a “service area” that is governed by a board of trustees with limited responsibilities, Murray said. Once it’s officially incorporated, Bluff will become the 247th municipality in Utah, according to the Utah League of Cities and Towns. It was first settled in 1880, and previously was incorporated from 1976-1978, according to the San Juan Record. A town council election will take place in June. After the council is seated, local leaders will file for incorporation, Murray said. In the meantime, a general town plan will be created. Having a town council will give Bluff residents more local control over services such trash collection and water, which currently are administered by San Juan County, Murray said. It will be easier for Bluff to apply for grants as an officially incorporated town, Murray said. Some of the area’s residents opposed incorporation, wondering if Bluff could support itself financially on its own. Others were concerned about the town’s new boundaries, according to the San Juan Record. The new town of Bluff will cover an area of about 38 square miles, including the town center and several nearby canyons. Murray said a financial feasibility study done by Salt Lake City-based Bonneville Research concluded that an incorporated Bluff could provide the same level of services to its residents without a raise in property taxes. People in Bluff see that the area is changing, especially with the rise in publicity in tourism due to Bears Ears National Monument, Murray said. President Donald Trump is scheduled to visit Utah in December, and he might announce boundary reductions for Bears Ears, as well as Grand-Staircase Escalante National Monument. The monument has made national headlines multiple times over the past year, and it’s drawing tourists to San Juan County who patronize hotels and restaurants in Bluff, Murray said. Once it’s established, the town council will work to gather input from residents on what they want Bluff to look like over the next 25 to 30 years, Murray said. They’ll start slow, moving the town forward at a pace the residents can afford, he said.